Gibson Musclecar Exhaust System 08-14 Dodge Challenger SRT-8 Gibson Musclecar Exhaust System 08-14 Challenger SRT-8, Gibson 617005 Exhaust Kit, Gibson Musclecar exhaust System, Dodge Challenger 6.1L Gibson Musclecar exhaust System, Dodge Challenger 6.4L Gibson Musclecar exhaust System, Dodge Challenger 6.1L exhaust [Gibson 617005 Exhaust Kit] - $689.95 : 3rd Strike Performance, Your Source for Late Model MOPAR Performance Parts and Accessories! Gibson Muscle Car exhaust systems deliver a deep powerful exhaust tone that screams performance. Each system is designed to reduce backpressure with mandrel-bent tubing and includes black ceramic coated or polished, intercooled T304 stainless steel tip(s). These exhaust systems include Gibson's Superflow performance mufflers with convergent flow technology (CFT) that tunes your exhaust by using resonance chambers, directional louvered tuning ports, and angular induction to draw exhaust gases into the muffler and expel it at a higher velocity. Adding more power and more sound is easy with Gibson axle-back exhaust systems. 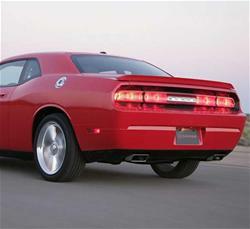 If even more performance and better sound are your priorities, look no further than Muscle Car dual cat-back systems. They are the pinnacle of performance and style. Select dual cat-back systems include an equal length X-pipe.